In a saucepan, combine grated piloncillo or dark brown sugar with water and cinnamon. Place over medium heat, once it simmers, lower the heat to keep it at a medium-low simmer for about 15 minutes, until it thickens to a light syrup consistency. Turn off the heat and remove the cinnamon stick. You should have now about 1 1/4 cups piloncillo liquid, need not be exact! Add butter and honey into the hot liquid and stir until it dissolves. In a mixing bowl, combine flour, baking powder, baking soda and salt. Make a hole in the center and pour in the piloncillo mixture. Mix it all together with a spatula until it is well incorporated. Combine the eggs into the dough, which will be sticky and gooey. Seriously: it will be GOOEY and that is OK.
Place plastic wrap in the bottom of a mixing bowl to have wings on the sides. With a spatula, push the dough onto the plastic wrap, wrap the dough, and refrigerate anywhere from 2 hours to a couple days. When you are ready to make the cookies, preheat the oven to 375 degrees. Grease a couple cookie or baking sheets with butter. Remove the dough from the refrigerator and sprinkle a couple tablespoons of flour on a countertop. Rub a bit of flour on the rolling pin as well. Roll out the dough which will now be firmer, until you have about 1/4 -inch thickness. 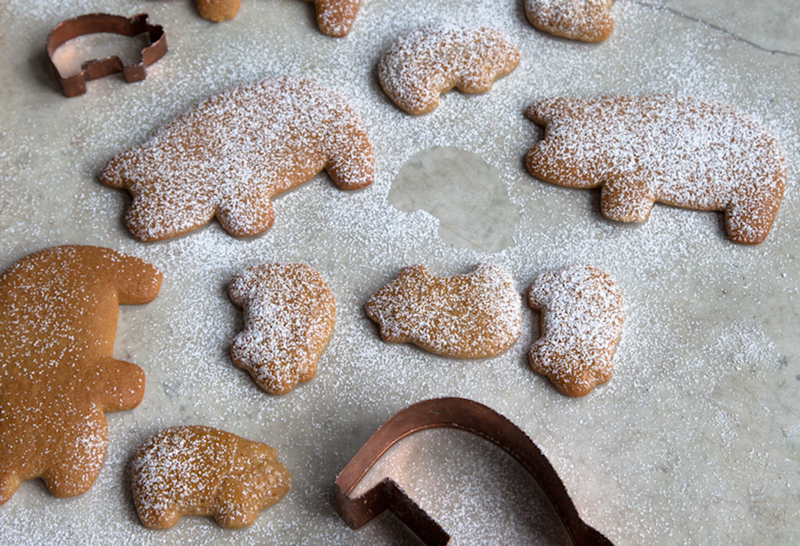 Using piggie cookie cutters (or other shapes, but then you may need to change the name!) press down on the dough, moving it a bit on the counter top, to make it easier to lift the shaped dough. Place the piggies on the baking sheet as you shape them along. Gently brush the cookie tops with the remaining egg. Roll the leftover dough into a ball, wrap it with the plastic wrap, and place it in the freezer for at least 10 minutes before using it again, or it will be too soft and sticky. Repeat to make the remaining cookies. Bake the cookies anywhere from 7 to 9 minutes. Remove them from the oven and place on a cooking rack. You may sprinkle confectioners’ sugar on top. Keep them covered so they remain soft. My boys love to eat them with a tall glass of milk, I like them with a hot cup of coffee. Do you know if anyone has done this with keto friendly ingredients like almond flour and monkfurit? I don’t…but give it a go and let me know how it goes, Dusti. Where can I buy a piggie cookie cutter? I have looked and looked and have had no luck. My girls love them. Oh I got mine so long ago…have you tried looking online, maybe? I hope you find one soon, Roberta! Thank you Pati my husband loves these I will have to make them. Yay! I hope you guys enjoy them. Thank you for sharing this recipe! This is one of my favorites! So happy they are your favorites, Lily! Why dobyou refrigerate dough 2 hrs? The dough needs to be refrigerated because it is very very gooey and sticky. Putting it in the fridge make it hard, so that it can be rolled out and cut into shapes.